Dimensions: 595 x 76 x 39 ft.
Service: Built for Union-Castle Line (British flag). London-South and East Africa service. Rescued passenger and crew of United Netherlands Nav Co's Klipfontein off Mozambique 8 Jan 1953. Sold to Chandris Lines (Greek flag) 1959; renamed Patris. Capacity increased to 1036, later to 1400 passengers. Greece-Australia service. 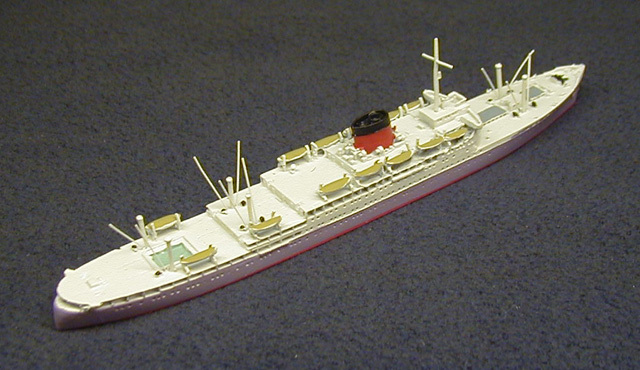 Sold to Karageorgis Lines (Greek flag), 1978, refitted for Eastern Mediterranean ferry service as Mediterranean Island. Renamed Mediterranean Star, 1981. Scrapped in Pakistan, 1987.